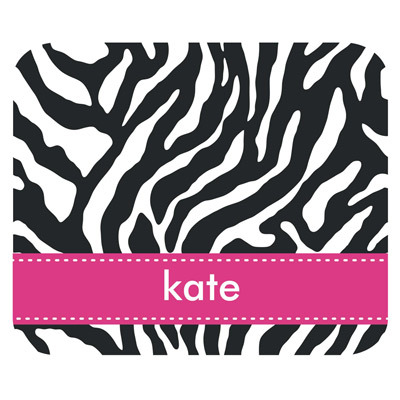 Personalize your office space with a stylish, customized Zebra animal print mouse pad. Choose either a first name or family name to create a special piece. Consider this as an office or hostess gift for your co-worker, boss or friend. Mousepad measures 9.25″ x 7.75″ and 1/4″ thick. Text entered is case sensitive according to chosen font. Futura is available in lower case only. Greek, Monogram, Script and Times New Roman are available in upper case only. Several personalization styles are available; hollow circle, solid circle rectangle and ribbon band. Circles and rectangles are available with 1 initial, 3 initials or greek letters. Ribbon band is placed towards the bottom of the mousepad and is available with first name or family name.